On the way to The Wall, the surviving section of the perimeter wall that had once enclosed the Second Temple, the Herodian temple, built on land purchased by King David from the Jebusites, a majestic structure standing at the apex of Jerusalem, visible for miles, luminous and awe inspiring, later destroyed by the Romans, one must pass through the Souq, a dark, tightly packed marketplace of shops selling spices, clothes, jewelry, art and food. 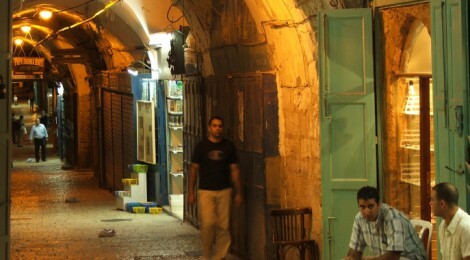 The winding Souq is bisected by a descending alleyway of stone steps. The vendors, all men, open their shops at about ten a.m. They sweep the floors and groom and adjust their wares. Once done, they sit amidst their bounty. They speak a clicking, melodious Arabic. I pass thick strapped leather sandals on low shelves. Glossy upright luggage stand sentry at the entry to their stores. Fabrics hang from overhead racks like tapestries. Silver candelabras reflect the overhead lights. Young men carrying chained circular metallic trays balancing one or two small glasses of steaming brown liquid rush up the alley. They enter the shops and serve the shopkeepers. Long frocked men with tall staffs and red hats march by. “Syrians!” I hear someone say. The last man in the procession, ruddy cheeked and sable haired, seems to smile. “I wonder if the Syrians let their priests marry,” I think. Down, down, the pitted, smooth stones I go. I see determined parents carefully lifting strollers down the steps. The fathers haul the front of the carriers, the mothers steer from the back. I see grandmothers firmly clasping the arm of their grandchild, gingerly make their way. All are headed to The Wall. I follow a French and Hebrew speaking tour group. I stand to the rear and listen to the guide. To my surprise, I find myself able to understand his comments. My college French and grade school Hebrew have come tumbling back. As the guide starts to move on, I ask “Pardonnez-moi, monsieur, ou se trouve Le Wall? “How did you know that I was an American?” I ask. I see a group of people dressed in identical lavender and white patterned fabric. The men wear loose shirts outside their trousers, the women, dresses and turbans. Three schoolgirls in long skirts, white tights and long sleeves rush up and ask her if they cam take her picture. “Nigeria,” I tell the girls, over my shoulder. Two soldiers man the devices. One is tall and white haired. The other, slender faced and fine featured is African. They speak to each other in Hebrew. The people around me speak Portuguese, Spanish and Japanese. We are all headed to The Wall. And then, below us, we see it. Shafts of yellow and white sunlight hit the colossal stones. Puffs of foliage rest between the cracks. Even millennia later, the enormity of it astounds. Hundreds of men and women stand below us, separated by a partition. All is quiet, except for the low hum of prayer. I pass a seated Asian woman intently writing on a small piece of paper. I remembered the note I had placed in The Wall when I first visited it as a teenager. But Israel was to have no peace and would experience war after war for decades to come. I saw a solemn, Germanic looking woman, her hair covered by a scarf, move towards The Wall. Some held their prayer books close to their faces. A woman turned around and faced me. Her features seemed to be etched with all the sorrow of the world the violence, the loss, the meaningless deaths. What was it about The Wall that provoked such pain, such awareness, in so many? I drew closer to The Wall. Its limestone surface was grooved and pitted. Tightly folded notes were pressed into the divisions between the blocks. Many more lay fallen on the ground. The women around me stood silently, their lips moving rapidly, like the biblical Hannah. So deep had been Hannah’s grief at her barrenness, so fervent her longing for a child, so profound her prayers, that The High Priest had accused her of drunkenness. The High Priest blessed her and the next year she gave birth to a child who grew up to be the prophet, Samuel. I looked to my right, at the end of the women’s section, about five feet above the ground. “That’s my stone,” I whispered. I remembered how, a number of years earlier, on another visit to The Wall, I, too had prayed, silently, wordlessly and I, too, like Hannah, had received comfort and resolution. I looked back at The Wall. I craned my neck upwards. The huge, dressed blocks were powerful. Millions of men and women had stood before them, remembering the destruction of Jerusalem, the Temple, the dispersion, the expulsion, in history and in their lives. I glanced over the top of the partition towards the men’s section. Some of the men wore black wear caftans, some, jackets with the insignia of sports teams. I approached the fence and peered through its slats. Three bar mitzvahs, of Ashkenazi, Moroccan and Yemenite ritual, were taking place. In one group, a boy rode on a man’s shoulders as other men exuberantly sang and danced, drawing the bearded rabbi into their joyous reel. Nearby, an ornate tubular torah case rested on a man’s shoulder as a Levantine child, his molten brown eyes filled with pride, read from an opened scroll in a high pitched singsong voice. Several women stood on chairs overlooking the division, voicing startling, shrieking ululations as they looked at their sons, grandsons and nephews. I drew my jacket closer. Jerusalem was cold in the winter. Was the cold caused by the return of displaced souls? I recalled the hijabed woman I had seen being interviewed and filmed near the Damascus Gate in the Arab section of Jerusalem. I could not understand what she was saying, except for one word. She repeated it over and over again. Her tightly wrapped face was expressionless. I looked at her clothes. Blue jeans were visible under her long, black tunic. I listened as she repeated the word. I was aware that men wearing red and white checkered keffiyehs stood behind me. I wondered if they thought I was a German tourist. I decided that if anyone said anything to me, I would ask “Bitte?” but no one did. I made my way past the stacked nougats and dates. Two Arab boys, about seven or eight, were playing. One had a retractable ball point pen and began to make stabbing motions towards the other. Their interaction began to escalate as the boy with the pen became more and more aggressive. I looked around for someone to intervene. The men and women continued to walk by. Undeterred, he continued to lunge and thrust at the other boy. Then, the second boy, a pen suddenly appearing in his upraised hand, began to attack as well. I walked away, shocked at the ferocity of their interaction. I gazed at the back of an olive uniformed Israeli soldier. She pressed her forearm against The Wall and lay her head. Her auburn hair shone in the sun. The Nigerian women arrived at The Wall and approached. I picked up a Russian and Hebrew Book of Psalms that had been left on a chair. I caressed the embossed letters. Together with Asian, Ukrainian, American and French women, I began to walk backwards away from The Wall, both in reverence and in the hope of retaining one last, lingering image of Jerusalem’s monumental symbol of faith and prayer. Jerusalem is a city that is constantly rebuilding itself. In the neighborhood in which I was staying, Baka, about a mile from The Wall, house after house was being remodeled or newly constructed. As I walked the narrow streets, I peeked behind fences and overgrown foliage as dust flew and equipment sounded. Sitting in a corner café, I observed the local population. I saw men rushing to synagogue services, nuns, their long habits brushing against the sidewalk, a group of mentally handicapped young people led by their counselors. For most of the Jewish population in Jerusalem, the work week ends one hour before sunset on Friday. Stores and restaurants close. Buses ceased to run. People carry Sabbath purchases in plastic bags. Many carried flowers. Greetings of “Shabbat Shalom!” are heard everywhere. On my second or third day in Jerusalem, I boarded an Arab bus. I had not known that Arabs and Jews rode separate buses in Israel. This was a head wringer for me, an American who well knew the history of discrimination practiced in the U.S. prior to the passage of the federal Civil Rights Act. Here, in Israel, where both Arab and Jew had equal rights, people apparently chose to ride separate buses. Though, as I later learned, the buses seemed to be of equality quality and arrive with equal frequency, the bus I mounted that day must have been one of the older ones. It was small, dark and filled with glaring men, some in hooded sweatshirts. I stood near the driver. I thought, somewhat gaily, “Okay, HaShem, I’m in your hands!” After a while, a middle aged man rose and with a smile, indicated that I should take his seat as he moved to the rear of the bus. I was profoundly grateful. He reminded me of my late uncle, a Holocaust survivor, a man who despite having lost his first wife and child in the war, took every opportunity to practice “chesed”, kindness. With a start, I realized that my uncle was buried just two or three miles distant, on the Mount of Olives. The day after his death in Brooklyn, NY, his body was placed on an El Al jet flying to Israel. His widow, his daughter, my parents and I followed the hearse to the airport. “I see his face,” I blurted out. Everyone was silent. “His face is like the moon. He is healthy.” I turned around to look at my aunt, worried that I had offended her but she looked calmly right back at me. She had accepted what I had said. In years to come, his daughter no longer visited his grave on the Mount of Olives. It had become too dangerous. Electric Chanukah menorahs hung from the arms of the street lamps. Jerusalemites sat in the restaurants, rode the buses, bought the latest fashions from Europe. I didn’t know how they did it. War after war, daily threats, attacks, but Israelis went on living with great gusto. I decided to visit Rumanian cousins whom I had never met. After the war they remained in Bucharest, then immigrated to Israel thirty years or so later. I was overcome by their generosity, their easy familiarity, their hunger for family information. Mauthausen? I thought. I had never heard of a Jew who survived Mauthausen. Later, she told me that her mother had fled to Austria where she had been captured and sent to Mauthausen. Having overcome my initial helplessness at the language, coinage and transportation, I took a bus to the fortress of Masada, located in the Judean desert atop a mesa at the shores of the Dead Sea. It had been the last stronghold of a group Jews who had fled the destruction of Jerusalem. I took the tram to the summit. Nearly all visitors to Masada immediately turn right and tour the ruins of the palaces, thermal baths, frigidariums and storehouses. I decided to go off on my own. I walked slowly, my eyes on the ground, the sun warming my face and shoulders. I passed deep cisterns carved into the rock. When filled with the winter rains, they had sustained the community for months. Suddenly I came upon a room-size crevice. Three or four stone steps led to a flat surface. It was a ritual bath. Seeking spiritual sanctification, a man would immerse himself in the icy rainwater. The celestial stars hung low in the black desert sky. The cold wind spun like curlicues around their bare ankles, exposed shoulders. In the dim light, I could see remnants of the plaster that had once smoothed the floor. I stood there for a long time, then began to walk away. I heard the sounds of birds and looked up. Pairs of small black birds, framed by steep, sepia colored cliffs, were perched on the remnants of a stone wall that had once surrounded the stronghold. Were they descendants of the avian witnesses to the Roman siege and destruction of Masada? A teacher from Portugal and I visit Yad Vashem. She is elegant, beautiful, traveling alone. Her English is perfect, her accent indistinguishable. She is a devout Catholic, she tells me. She teaches children with special needs. Her presence tempers my reaction to the canisters of Zyklon B, blackened shoes, photographs and video taped testimonies. We reach a white model of an Auschwitz gas chamber. Suddenly, I see, that in order for the people to enter the massive death rooms they had to descend a staircase. I recoil with understanding. I am no longer touring a museum. I am no longer in possession of credit cards, an American passport. I am barefoot on the steps of a subterranean death chamber. Towards the end of my visit, I met with Itamar Marcus, Director of Palestinian Media Watch. I sat in a sunny room filled with blonde furniture. Stacks of Arabic language newspapers were piled high. To my eyes the squirrelly, looped and linked letters were indistinguishable from one another. Palestinian Media Watch is a monitoring organization whose work includes the translation of the Arabic words of the leaders of the Palestinian Authority, Fatah and Hamas who frequently say things in direct opposition to their English language statements. PMW is a primary source for the Israeli government, US and European legislators, analysts, commentators, journalists and bloggers. Marcus is a careful, gifted and guarded reporter. Reportage of the often vitriolic Arabic quotations that he and his staff have uncovered has, I think, brought him a certain sadness. My guess is that he sees Palestinians, especially children, who are exposed to the unrelenting, unbalanced apocalyptic and repressive official Palestinian media, as being denied participation in or the ability to create an open, pluralistic society in which religious, gender and voting rights are guaranteed. It remained unsaid, as Marcus and I spoke, that just across the border, over two hundred thousand Syrian civilians had been killed within the last few years, partly as a result of savage political rhetoric and extremist ideologies. Marcus described the balance of powers between the three Palestinian organizations. “Who is going to win?” I asked. In 2006, Hamas won 74 seats of the 132 seats in the PA parliament, while Fatah won just 45. In 2006, Hamas won the elections in both the West Bank and the Gaza Strip. Marcus also cited polls and statistics, taken just after the Oslo accords, in which the Palestinian residents rated Israel higher than the US, France and the PA in human rights and democracy. The polls showed that in subsequent years, under the PA regime which poisoned the Palestinian population with hatred of Israelis and Jews, the admiration for Israel went down. Israel’s “giveaway” apparently had the opposite effect of what it might have intended. Palestinians now hold Israel in contempt, laud Hamas and glorify terrorist murderers. It was his opinion that were there a Palestinian state, Hamas would eventually oust (my word) Fatah, either through a democratic election or by military means as they did a few years ago in Gaza and that Abbas’ own viability is ironically being sustained by Israel as the world negotiates. On my last day in Jerusalem, I returned to The Wall. The weather was still cold. I walked briskly down the steps of The Souq. The path was filled with people from every continent. I wondered at how such a meaningful, even beloved place could have experienced so much violence and bloodshed over the years. I found myself praying as I had so long ago, for peace between all residents of the region. I pass a distinguished looking Arab man, holding the hand of a handicapped young adult as they make their way along the cobbled corridor. On the way to the airport, I suddenly realize that I could now recognize the different Hebrew and Arabic letters on the passing road signs. It was a poignant moment as I recalled that all Semitic people are related. Isaac’s wife, Rivka, was the mother of twins, Esau and Jacob, progenitors of the Arab and Jewish nations. Though she must have loved them both “..for how can I lose both of you at one time?” (Gen. 27:42-43) she choose Jacob, a tent dweller, over Esau, a man of the fields, to inherit the Abrahamic spiritual leadership from Isaac. I had booked a return flight on Lufthansa. I was somewhat in shock that I was on an airline with the word “Luft” in it. At the beginning of World War Two, my father’s Polish town had been bombed by another fleet with the word “Luft” in it. That attack and the fact that my father had believed Hitler’s “Mein Kampf” promise that he would kill the Jews, impelled him to insist that his family join the Soviet army as it retreated back into Russia. As a result, seventeen members of his family survived. We had a three hour layover in Munich. Heavy chalk-like snow covered everything. I remembered that my parents, who lived in post-war Germany for four years as they waited to be admitted to the United States, had often told me that Munich had been brutally cold and that the snow had been “this high” gesturing above their knees. My father had been employed by the U.S. Army motor pool. He drove officers to Munich several times a week. He would never return to Germany or to Poland. He refused. Other relatives went, he would not. There were a number of observant men on my flight. I saw a man standing alone at security. He wore a prayer shawl over of his suit. He carried an overcoat and a hat. In another era, Germans surrounding a single traditionally garbed Jew would have been an ominous thing. I realized that this was no longer the case and decided that if Lufthansa was good enough him, it was good enough for me. And, in response to my questions, she tells me one more Holocaust story, one I had never heard her relate, although we had known each for years. During the war, her Polish parents obtained false identification documents and were scheduled to join her and her husband (“He really looked like a Pole!”) in Budapest where they were living, also in possession of doctored papers. The woman, whom they had paid and who was to guide them, betrayed them and they and two other families were sent to Auschwitz. “What happened to her?” I asked. Elaine Rosenberg Miller is a writer living in West Palm Beach, FL. Her work has appeared in numerous publications including NEWSMAX, Palm Beach Daily News, and The Forward. Her short story, THE NIR TAMID was chosen as one of the best short stories of 2013. This is her second appearance in The Bangalore Review.